the case of disease in my family has caused me to think a lot about health and the benefit good food has on our bodies. it’s like i’m suddenly feeling a new responsibility to create more wholesome meals – for you and me. so lets talk about healthy diets (i can see you rolling your eyes, there!). well, i’m not really a health fanatic (i’m sure this comes as no surprise, considering every second post is a ‘dessert’ in disguise…), but i do love my vegs! i never grow tired of them. luckily for me, i must add, because they nicely balance out my excessive chocolate/candy/cakes/cookies – ‘the evil 4cs’, as i call them – consumption (and i consume a lot of them… especially when i’m frustrated). or so i think. in any case, vegs are welcome on my plate in any shape, basically any time (if they’re followed by a cookie, that is). but routine is so boring! so i’m constantly seeking exciting new combinations and simple ways to incorporate healthy dishes into my everyday life. this probably sounds funny, this coming from me, the dessert-queen, but here are my basic tips for an effortless healthy diet. a good start is to shop seasonal and local produce, whenever possible. the benefit of eating seasonal vegetable and fruit is the ‘excitement factor’: because the time frame for consumption is limited, seasonal produce makes you anticipate, longingly, its arrival on the markets. like, the first asparagus that i see in march usually asks for a little feast. local also means you get food that was harvested when already ripe and good to eat, and while you get it it’s still fresh, and thus the nutrients are still ‘intact’ (or whatever). plus, whenever i go shopping, my basic rule of thumb is to at least buy 2/3 fresh produce (i.e. unprocessed, raw goods, like vegetable and fruit). it’s pretty simple: we eat what’s at home. so if you buy brocoli – you’re likely to eat that brocoli (out of a lack of alternatives – unless you find your safely hidden secret stash of sweets… then you’re just up to no good and i can’t help you, clearly). next, you have to think of a way to prepare your fresh, seasonal, local produce. it doesn’t always have to be a complicated recipe or a proper ‘dish’ at all – but i realize that’s where a lot of people need support: in the recipe and inspiration department. i let you in on a secret: my way of cooking is totally simple. in fact, i often find myself just throwing togetter a few basics. what i always check is my so called ‘the 3 g formula’ (okay, i totally just made that up right now, but it makes sense anyway): greens, grains and garnish. that’s really the secret formula to quick, fuss-free and healthy eating. ‘3g’ means you combine a grain (like rice, wheat, quinoa, buckwheat, bulgur, barley or freekeeh) then prepare your basic greens (vegs in any shape, like romanesco, broccoli, cauliflower, spinach, chard, leeks, heirloom tomatoes, peas, beans) and think of ways to add a twist. that’s what i call the garnish, it can be a few things you toss in or a special spice mix or a dressing. toss everything together – and you’re done! healthy meal in no time. the major plus: you get to prepare and precook the grains in advance, for later use, and store it in the fridge or freezer. that saves a lot of time. when it comes to vegs preparation, i’m fuss-free, because i like them any possible way: steamed, blanched, baked, roasted, grilled, sauteed, julienned, fried, pureed or raw – any way at all. to always steam them, sure, it’s healthy, and it can be really delicious (but mostly very bland…). there will come the day when you will want some change… so in order to stick to a healthy diet, variety is key! try new methods. you like your snow peas steamed? try frying them! i usually blanch my asparagus, sometimes i fry it – but somehow i’ve never roasted it before (strange, considering i’ve roasted everything from artichokes to turnips…). but now, i especially like it roasted, as it renders the texture unexpectedly crunchy, gives it a nutty taste and is just so much more surprising. it’s like it’s enhanced, by some strange formula. therefore my advice for the vegetable preparation: try a new method, you can’t really make anything wrong. and if you don’t know what to do with your veg on hand, just try roasting it; it’s fool proof. so basically what i’m telling you is ‘to be creative’. yeah well, that much we knew (are you rolling your eyes at me again? hey!). but well here’s the thing. you can totally be creative (in fact, i’m hoping you will be!) – but the crux is: you need to be well prepared (and no, that’s not mutually exclusive, to be creative and well prepared). meaning: your pantry needs to be well-stocked. it is your friend! treat it nicely. if you keep it well-stocked, you won’t have to go grocery shopping on every night of every day. big time-saver! sure, a little olive oil, a squeeze of good lemon and a sprinkle of maldon sea salt go a long way..! but then again, you might want to add some ‘ooomph’ to make the difference between a bland side dish and a satisfying main dish. there are a few staples in my pantry that are always go-to additions to any dish. in the seasoning category, there are for exmple harissa (or sriracha hot sauce), lemon juice (very big in my home), maple syrup (for caramelizing, good for roasting), tahina (sesame paste), cumin or other spices, soy sauce, fragrant vegetable oils (like pistachio or truffle), curry pastes or herbs. in the protein category, you might want to add plain yogurt (turned into a simple dressing), boiled, poached or fried eegs, shaved cheese, pre-cooked or store-bought and canned legumes (like chickpeas or lentils), toasted nuts (almonds, pistachios, pine, pecan…) or fish (tuna is a pantry staple). also, fruit or berries (both fresh or dried) add color and impressiveness. my classic ingredients are: lemon rind, a handful of herbs (mint or parsley are my faves) quickly turned into a salsa verde and sriracha (for heat). if you have a few of these ingredients on hand in your pantry, the combinations are limitless! and that’s actually the part i like best: to think up new ways to treat the little bulbs, globes, roots and other healthy treasures from the earth and turn them into a lush meal. 5. don’t think too much! don’t put yourself under pressure to always only eat healthily. it’s all in the mix! feel free to add sausage slices to your stir-fry! or heavy cream to your vegetable gratin! it won’t kill you, so relax! if everything else ‘makes sense’, then a few greasy calories won’t hurt you. the main goal is to make healthy eating fun. it’s a good feeling to avoid pre-cooked or overly processed foods – because in my opinion that’s really the opposite of healthy – whenever possible. but if you follow these 5 simple rules, healthy eating should be peanuts (you see, i didn’t even say ‘piece of cake’… my system is already programmed for healthy eating, ahem). by the way: for this little side dish of oven-roasted asparagus with lemon and thyme, all you have to do is place the asparagus on a baking sheet, drizzle it with olive oil, add some lemon slices for good measure, some thyme sprigs and a generous pinch of maldon sea salt, simply leave to roast for about 20 minutes and voilà – your fragrant spring feast is ready. it doesn’t even need a vinaigrette, but it would be good with some toasted, chopped almonds or strawberries and goat cheese crumbles… next time around. the first asparagus every year deserves to stand out on it’s own. "if everything else 'makes sense', then a few greasy calories won't hurt you"
By the way, sounds like you're a fan of different oils etc. 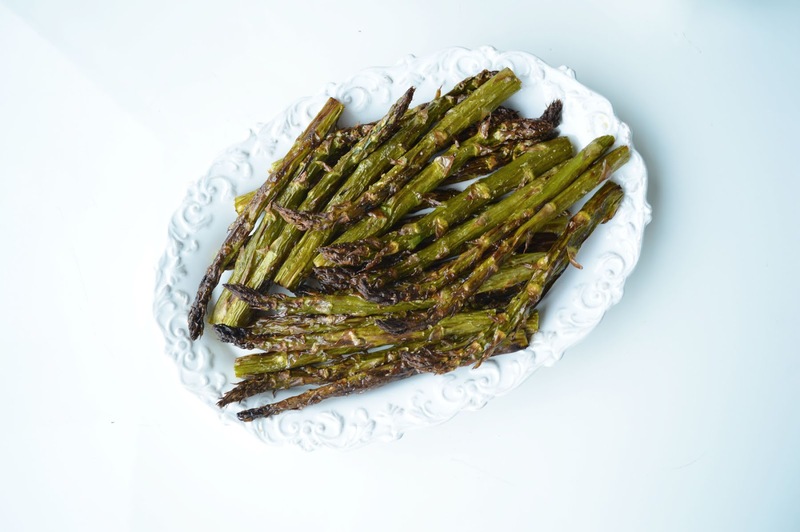 give ponzu a try with your roasted asparagus next time. It's great with salt.